Harper always has some sort of medical issue. Nothing life threatening, but there's always something going on with her (another post for another time). We joke that her middle name should be "co-pay" because she's always seeing either her pediatrician or some other specialist. 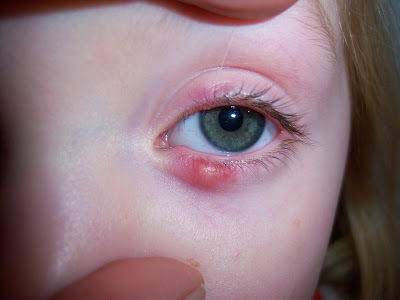 Her latest is a chalazion, which is a blocked oil gland on either the upper or lower eyelids or both, which is her case. This isn't her first chalazion. She developed them in June 2008 when we took her to our optometrist who, after treating her unsuccessfully for about 6 weeks, referred her to an ophthalmologist. After months of treating her, the ophthalmologist finally cleared Harper on December 9, 2008. Now, it's back. It's like a bad penny. It's not easily cover able either. It's the eye. Other than wearing sunglasses (not likely for an almost 3 year old), it can't be covered. And it's pretty yucky looking, too. So, we make the 30 minute trek to the ophthalmologist yesterday morning at 9:15, a frighteningly early appointment for me. The fact that everyone at this office is incredibly nice and absolutely wonderful with children make the appointment comfortable and uneventful. We are given the normal instructions: hot compresses 3-5 times per day followed by a 1-2 minute gentle massage of the chalazion to open it in order for it to drain. Amazingly, Harper is very cooperative. She's the best patient and always has been. She lies down on the sofa and keeps the compress on her eye. She doesn't wince or whine when I massage her eye. I hope it heals quickly this time. Her first chalazions never drained. We waited months for them to go away, which eventually they did and with their passing, they left behind a small amount of scar tissue. Barely noticeable to anyone but me. The bottom line is that 3 year olds should be running around the house tearing apart everything that's just been put away not holding hot compresses on their eyes! For more information on chalazions, click here.